The Authentic Gilbert & Sullivan Songbook Vocal Score. William Gilbert & Arthur Sullivan. Dover Publications. 1978. ISBN 0486234827 (paperback). 92 songs from all 14 operettas, uncut & unedited, in original keys and in piano arrangements authorized by Sullivan. Included: "I'm Called Little Buttercup" from H. M. S. Pinafore and "When the Foeman Bares His Steel" from The Pirates of Penzance. Plot synopses. The Gondoliers Vocal Score. William Gilbert & Arthur Sullivan. G. Schirmer, Inc. 1986. ISBN 0881887226 (paperback). English Only. With complete dialogue. H.M.S. Pinafore or The Lass That Loved a Sailor Vocal Score. William Gilbert & Arthur Sullivan. G. Schirmer, Inc. 1986. ISBN 0881887234 (paperback). Trusted the world over, the classic, authoritative G. Schirmer editions of the stage works of Gilbert and Sullivan have been spruced up! These new vocal scores feature the complete music and all dialogue, gorgeous color covers, plot synopses, articles on the famous partnership, the history of each operetta, filmographies and discographies. The sewn binding ensures a lifetime of use. 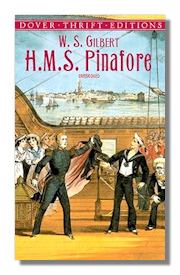 Unforgettable characters populate this fourth Gilbert and Sullivan collaboration, a romantic satire of the British social class system and naval hierarchy. Musical highlights include: We Sail the Ocean Blue, I'm Called Little Buttercup, Sorry Her Lot, I Am the Monarch of the Sea, When I Was a Lad, Never Mind the Why and Wherefore, and more. Iolanthe or the Peer & the Peri Vocal Score. William Gilbert & Arthur Sullivan. G. Schirmer, Inc. 1986. ISBN 0793534798 (paperback). The Mikado Vocal Score. William Gilbert & Arthur Sullivan. Wildhern Press. 2008. ISBN 1848300301 (paperback). Or, The Town of Titipu. A facsimile reprint. Patience or Bunthrone's Bride Vocal Score. William Gilbert & Arthur Sullivan. G. Schirmer, Inc. 1986. ISBN 0881887250 (paperback). 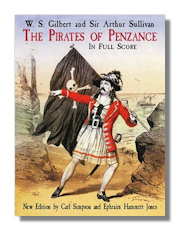 Pirates of Penzance Vocal Score. William Gilbert & Arthur Sullivan. Dover Publications. 2001. ISBN 0486418936 (paperback). This exemplary new edition of the vocal score of an enchanting operetta – which has delighted audiences for over a century with its catchy melodies, its witty lyrics, and its madcap taleof tender-hearted pirates, timid policemen, and the demands of duty – was prepared by musicologists Carl Simpson and Ephraim Hammett Jones, who returned to original manuscripts and early sources to produce handsome, newly engraved plates closest to Gilbert and Sullivan's original intentions. All of the voice parts appear here, in addition to a piano reduction of the full score and the complete libretto. Introduction by the editors. Contents. Instrumentation. 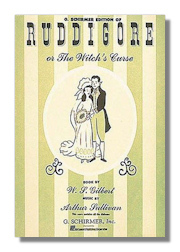 Ruddigore or The Witch's Curse Vocal Score. William Gilbert & Arthur Sullivan. G. Schirmer, Inc. 1986. ISBN 0881887277 (paperback). Trial by Jury Vocal Score. William Gilbert & Arthur Sullivan. G. Schirmer, Inc. 1986. ISBN 0881887285 (paperback). Yeomen of the Guard Vocal Score. William Gilbert & Arthur Sullivan. G. Schirmer, Inc. 1986. ISBN 0793553784 (paperback). H.M.S. Pinafore Full Score. William Gilbert & Arthur Sullivan. Dover Publications. 2002. ISBN 0486422011 (paperback). New edition by Carl Simpson and Ephraim Hammett Jones. Popular from its first performance in 1878, this work contains some of Gilbert's most clever flashes of wit and a number of Sullivan's most charming melodies. Music scholars Carl Simpson and Ephraim Hammett Jones have drawn on original manuscripts and early sources to produce handsome, newly engraved plates closest to Gilbert and Sullivan's original intentions. 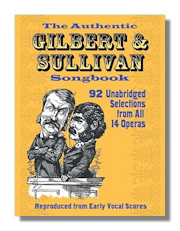 This authoritative and inexpensive edition is sure to delight Gilbert and Sullivan fans, operetta lovers, musicians, and students. 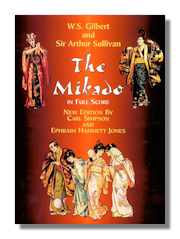 The Mikado Full Score. William Gilbert & Arthur Sullivan. Dover Publications. 1999. ISBN 0486406261 (paperback). The Pirates of Penzance Full Score. William Gilbert & Arthur Sullivan. Dover Publications. 2001. ISBN 048641891X (paperback). The witty and rollicking tale of a young man apprenticed to a band of pirates too kindhearted for their own good, The Pirates of Penzance, or The Slave of Duty remains one of Gilbert and Sullivan's most beloved and frequently revived works. This newly engraved performing edition is based on Sullivan's autograph, contemporary copyists' scores, and both the first and second editions of the vocal score. It corrects numerous errors that have crept in over the years and is the first edition to offer performers the choice of using either the 1880 or 1908 versions of the Act II finale. Aficionados will be particularly delighted with the first accurate full score of the "Climbing over Rocky Mountain" section, which incorporates music from the legendary lost Gilbert and Sullivan operetta Thespis. Introduction by the editors. Instrumentation. 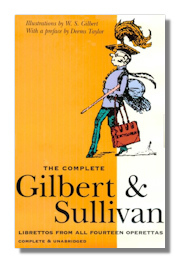 The Complete Gilbert & Sullivan: Librettos from All Fourteen Operettas. William Gilbert & Arthur Sullivan. Black Dog & Leventhal Publishers. 1998. ISBN 1579120377 (paperback). This ultimate book for the millions of Gilbert & Sullivan fans across the country offers the complete text and lyrics of all the operettas of this most original, creative and much-loved musical team. This book covers all of this dynamic duo's plays including: Thespis, Trial by Jury, H.M.S. Pinafore, The Pirates of Penzance, The Sorcerer, Patience, Utopia, Limited, The Grand Duke, Iolanthe, Princess Ida, The Mikado, Ruddigore, The Yeomen of the Guard and The Gondoliers. In an age where television and movies seem to be taking over popular culture, the sardonic, playful, intelligent, works of Gibert & Sullivan are a refreshing escape. 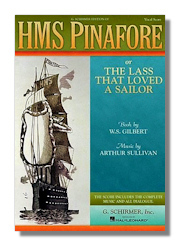 The combination of Arthur Sullivan – child prodigy turned noted composer – and William Gilbert – whose career in the military and stint as a barrister predated his true calling as a crafter of caustic wit and dramatic criticism – takes its place in musical theater history alongside creative teams such as Richard Rodgers & Oscar Hammerstein, George & Ira Gershwin and Leonard Bernstein & Stephen Sondheim. These timeless mainstays of the stage can be found everywhere, from high school auditoriums to professional G&S companies all over the world; now the complete works, including a preface by the famed music critic Deems Taylor and charming illustrations by William Gilbert, are collected here in one volume. H.M.S. Pinafore Libretto. William Gilbert & Arthur Sullivan. Dover Publications. 2000. ISBN 0486272680 (paperback). A lighthearted burlesque of Japanese culture and the vagaries of love, and one of the most widely admired of all the Gilbert and Sullivan operettas. The sparkling lyrics and witty dialogue of this comic masterpiece are as much a delight to read as they are to hear with musical accompaniment. 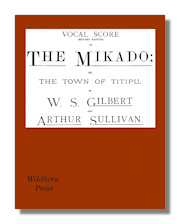 The complete libretto is reprinted in this edition from the standard performance text of The Mikado, complete with nine charming illustrations drawn by W.S. Gilbert himself. The Mikado Libretto. William Gilbert & Arthur Sullivan. Dover Publications. 1992. ISBN 0486411141 (paperback). 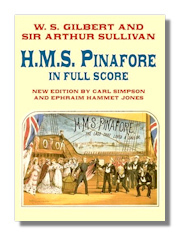 Among the most popular of the many well-loved works of Gilbert and Sullivan, H.M.S. Pinafore; or, The Lass that Loved a Sailor was written to be sung and acted on the stage; nevertheless, its sparkling lyrics and dialog shine no less brightly from the printed page. Pinafore satirizes the unlikely plot twists of grand opera and Victorian social rectitude with the tale of Josephine, the captain's daughter, and Ralph, the lowly sailor who seeks her hand. A comic gem, full of saucy banter and inventive rhymes. Great Twentieth-Century Violin Concertos in Full Score. Alexander Glazunov with Sibelius and Elgar. Dover Publications. 1995. ISBN 0486285707 (paperback). Three of the most popular modern violin concertos, reproduced from authoritative European and Russian editions: Sibelius' Violin Concerto in D Minor, Op. 47, among the most played and recorded of all violin concertos; Elgar's Violin Concerto in B Minor, Op. 61, a ravishing combination of bravura and sweetness; and Glazunov's Violin Concerto in A Minor, Op. 82, a masterpiece of lyricism and virtuosity. Instrumentation. Orfeo Ed Euridice in Full Score. Christoph Willibald Gluck, et al. Dover Publications. 1992. ISBN 0486273245 (paperback). Piano Music. Louis M. Gottschalk. Dover Publications. 1973. ISBN 0486216837 (paperback). 26 early 19th century piano pieces including "Bamboula," "The Banjo," "The Dying Poet," "The Last Hope," Sixième Ballade: & 20 more. Faust in Full Score. Charles Gounod. Dover Publications. 1995. ISBN 0486283496 (paperback). Full score of complete opera including the ballet music added for the 1969 Paris Opera premiere. 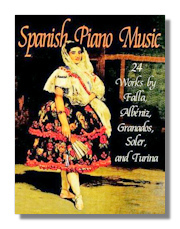 Goyescas, Spanish Dances & Other Works for Solo Piano. Enrique Granados. Dover Publications. 1987. ISBN 048625481X (paperback). Volume contains these works for solo piano: Goyescas, the 12 Spanish Dances, Escenas poéticas & three pieces from Escenas románticas. Complete Lyric Pieces for Piano. Edvard Grieg. Dover Publications. 1990. ISBN 048626176X (paperback). All 66 works from the ten sets of little "mood pictures" created for piano by the Norwegian composer from 1867 to 1901, reprinted from the authoritative C.F. Peters edition. Technically uncomplicated and reasonably easy to master, these popular works have been favorites of generations of pianists, both amateur and professional. Peer Gynt Suite, Holberg Suite & Other Works for Piano Solo. Edvard Grieg. Dover Publications. 1993. ISBN 0486275906 (paperback). Reprinted unabridged from C.F. Peters of Leipzig edition. Contains Peer Gynt Suites #1 & 2; Holberg Suite, Grieg's solo piano arrangement of his Piano Concerto in A minor, Four Pieces, Op. 1; Humoresker, Op. 6; Sonata in E minor, Op. 7; Zwei elegische Melodien, Op. 34; Stimmungen, Op. 73; more. 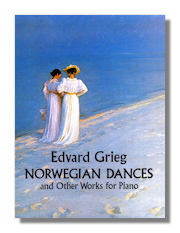 Norwegian Dances & Other Works for Piano. Edvard Grieg. Dover Publications. 1991. ISBN 0486266699 (paperback). Reprinted unabridged from C.F. Peters of Leipzig edition. Partial Contents: Slatter (Norwegian Peasant Dances) Op. 72; 25 Nordic Dances & Folktunes, Op. 17; Norwegian Dances, arr. of Op. 35; Two Waltz-Caprices, arr. of Op. 37; Two Nordic Melodies, arr. of Op. 63; 19 Norwegian Folktunes, Op. 66; 6 Norwegian Mountain Tunes; Ballade in G minor, Op. 24; Improvisata on Two Norwegian Folktunes, Op. 29; Pictures from Country Life, Op. 19. Norwegian Dances, Waltz-Caprices & Other Works for Piano Four-Hands. Edward Grieg. Dover Publications. 1997. ISBN 0486296113 (paperback). 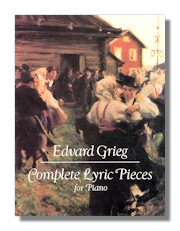 Convenient, inexpensive edition includes Grieg's own arrangements of Peer Gynt Suites Nos. 1 and 2; the four Norwegian Dances, Op. 35; Waltz-Caprices, Op. 37 and "Wedding Day at Troldhaugen," Op. 65, No. 6. Reproduced from the authoritative C.F. Peters edition. 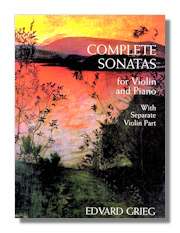 Complete Sonatas for Violin & Piano with Separate Violin Part. Edvard Grieg. Dover Publications. 1998. ISBN 0486402339 (paperback). Violinists and pianists of intermediate and advanced skills will delight in three charming, melodious works by Norway's most celebrated composer. The earliest (Op. 8, F Major) belongs to Grieg's "Danish" period; the others (Op. 13, G Major, and Op. 45, C minor) exhibit his characteristic nationalism. Convenient, authoritative collection unites three works only available separately elsewhere. 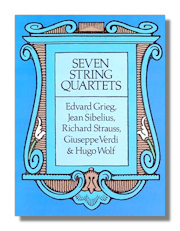 Seven String Quartets. Edvard Grieg, with Jean Sibelius, Richard Strauss, Giuseppe verdi & Hugo Wolf. Dover Publications. 1991. ISBN 0486268918 (paperback). Scores for Grieg's Quartet in G minor, Op. 27; Grieg's Quartet in F Major (incomplete); Sibelius' Quartet in D minor ("Voces Intimae"), Op. 56; Strauss' Quartet in A Major, Op. 2; Verdi's Quartet in E Major; & Wolf's Quartet in D minor & Italienische Serenade (Italian Serenade). Peer Gynt Suites #1 & 2 in Full Score. Edvard Grieg. Dover Publications. 1997. ISBN 0486295826 (paperback). Two orchestral suites that are staples of the repertoire, including such familiar favorites as "Morning Mood," "Anitra's Dance," and "In the Hall of the Mountain King." Musicians and music lovers will appreciate having these favorite scores in one handy volume. Reproduced from an authoritative edition. Piano Concerto in Full Score. Edvard Grieg. Dover Publications. 1994. ISBN 0486279316 (paperback). This stirring concerto is one of the most popular ever written, and one of the most recognizable of all musical works in the standard repertoire. It is filled with youthful ebullience – Grieg was 25 when he composed it – and great melodic inspiration, much of it derived from Norway's rich folk music tradition. 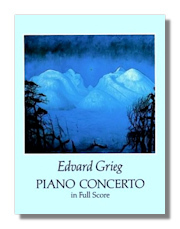 Deeply Romantic, with thrilling melodies and rich harmonies, it is the only piano concerto Grieg would compose. Reprinted here from the authoritative full-score edition published by C.F. Peters of Leipzig. The Grieg & Schumann Piano Concertos with Orchestral Reduction for Second Piano. Edvard Grieg, with Robert Schumann. Dover Publications. 1995. ISBN 0486287718 (paperback). The Grieg Concerto in A minor, Op. 16, and the Schumann Concerto in A minor, Op. 54, two of the most popular of all piano concertos in the repertoire, both among the less difficult great concertos, reprinted from authoritative editions. In each, the second piano part is an orchestral reduction, providing pianists with the two-piano format that is the standard method for rehearsal.